Elk nieuw te realiseren concept tracht de context van het voorgaande werk nader te preciseren. En geeft ook een richting aan, een aanwijzing voor nog te ontwikkelen concepten. Dankzij deze optelsom van de massa, de open ruimte, en de onderlinge verhoudingen van beide, doen Van Dijks verstilde sculpturen een sterk appel op de toeschouwer. The steel sculptures of Cor van Dijk (Pernis, 1952) are characterised by clear lines and geometric shapes. From first stages of their design, the material used for these works – steel – and their realisation are inextricably linked. To create his work, the artist uses separate sheets of solid steel, which he joins together with extreme precision. Van Dijk bases the dimensions of his sculptures on the standard gauge of the sheet metal. As a result, the mill scale found on the rolled steel is left intact in the finished works. Viewing Van Dijk’s sculptures, one’s eyes constantly move across their surface and one’s attention keeps shifting from areas of open space to sections that take up space. The seams between the different segments play a key role in the works, since they lend a sense of scale to the mass of steel and define its different volumes. The artist strives to show interior space – its layout, possible compartments, the spaces between the segments and the massive quality of the steel itself. The different dimensions all interact with one another. 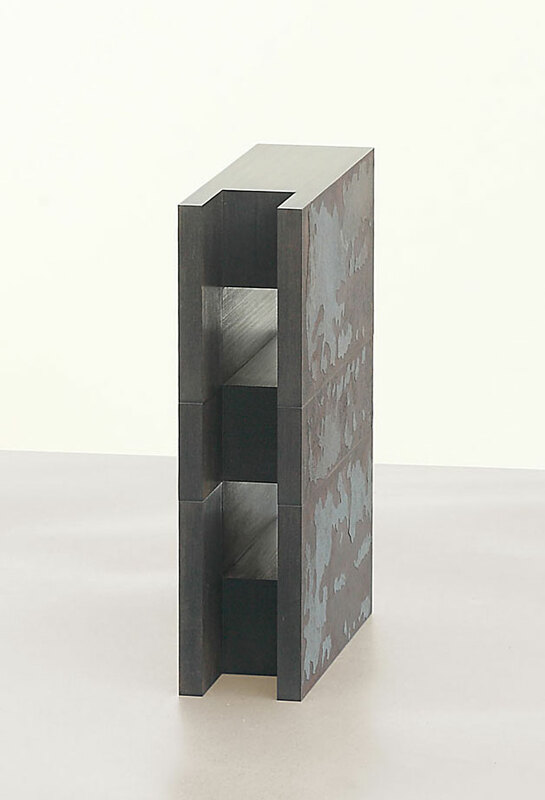 Ultimately, this is also what gives the sculptures their specific presence: the precise handling of volumes and the perfect connection of individual sections in space. Each newly-realised concept is intended to bring even greater clarity to the context of the preceding work – while also pointing ahead, suggesting new concepts that are still waiting to be developed. Viewed head-on, Van Dijk’s sculptures seem quite unambiguous. But when you observe them from a variety of angles, this clear-cut quality makes way for a new complexity that takes more time to fathom. The seams created by the careful positioning of the individual metal sheets form a two- and three-dimensional drawing – both across the sculpture’s surface and within it. Over time, the artist’s explorations and realised projects have yielded a unique generative system in which each evolution, each addition and each realisation charts its own course, fulfils its objectives and ensures that the whole ‘makes sense’ – for the moment, at least. A sculpture’s realisation is the final stage of a long process. The artist needs to wait until the entire design process has been rounded off and the concept is fully developed. The different dimensions all need to be determined with millimetre accuracy. In this method of working, any further interference during or after the sculpture’s production is out of the question. This puts considerable pressure on Van Dijk’s work process – which he sees as a good thing, incidentally. 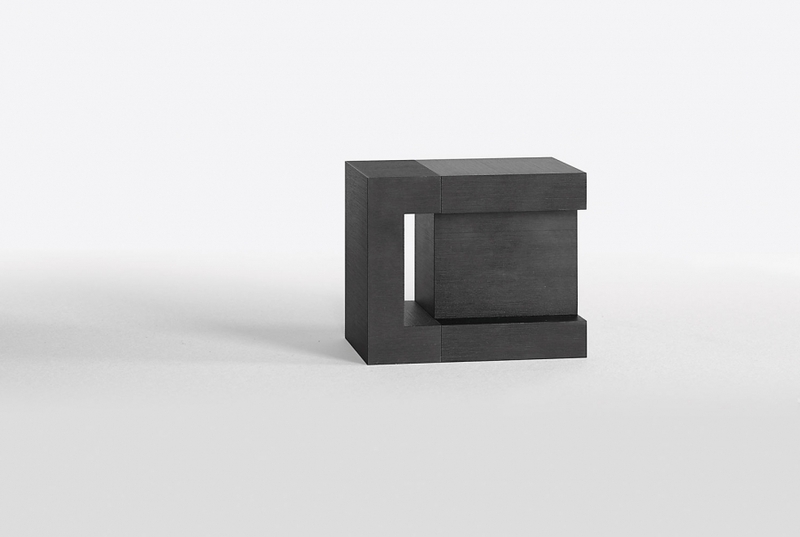 Van Dijk’s most recent sculptures comprise a single segment. The location of the open space and its dimensions determine the scale of the work as a whole. The result is an object in which mass (matter) and open space interact more intensively than ever before. In technical terms, the steel used for the sculptures shows no traces of machining or processing. Thanks to their mass, the open space and the interaction of these two elements, these tranquil objects seem to speak directly to the viewer.